Background Tuberculosis (TB) is an inflammatory disease caused by infection with Mycobacterium tuberculosis (Mtb). The disease is often characterised by destructive pulmonary pathology, which itself aids transmission, and many who complete otherwise successful treatment are left with lasting respiratory impairment following TB-driven tissue damage and remodelling. This is largely mediated by matrix metalloproteinases (MMP) induced in the inflammatory response. The CD33-related siglecs are transmembrane receptors that bind sialic acid. They are selectively expressed on immune cells, where they mediate inhibitory signalling. Murine Siglec-E is upregulated on macrophages by LPS. Its activation by crosslinking with sialylated nanoparticles reduces inflammatory cytokine release and mortality in murine models of sepsis and lung injury. Siglecs −5, −7 and −9 are candidate human orthologs of Siglec-E, known to inhibit inflammatory cell activation and proliferation. We hypothesised that the human orthologs of Siglec-E are upregulated in response to Mtb, which like LPS is a TLR-4 ligand, and that their activation would reduce TB-driven inflammation. Methods Siglec expression at gene and protein level on primary monocytes isolated from blood donation, and in a monocyte derived macrophage (MDM) model was investigated by qPCR, flow cytometry and western blotting in both unstimulated and Mtb-infected cells. Monocytes and MDMs were infected with Mtb and incubated with antibodies to either neutralise or crosslink siglecs -7 and -9. The effect on their secretion of inflammatory cytokines and MMPs or their inhibitors (Tissue Inhibitors of Metalloproteinases – TIMPs) was measured by ELISA. Siglecs -5, -7 and -9 are constitutively expressed on human monocytes and MDMs. Unlike Siglec-E in mice, these siglecs are not upregulated by LPS stimulation, nor by infection with Mtb. 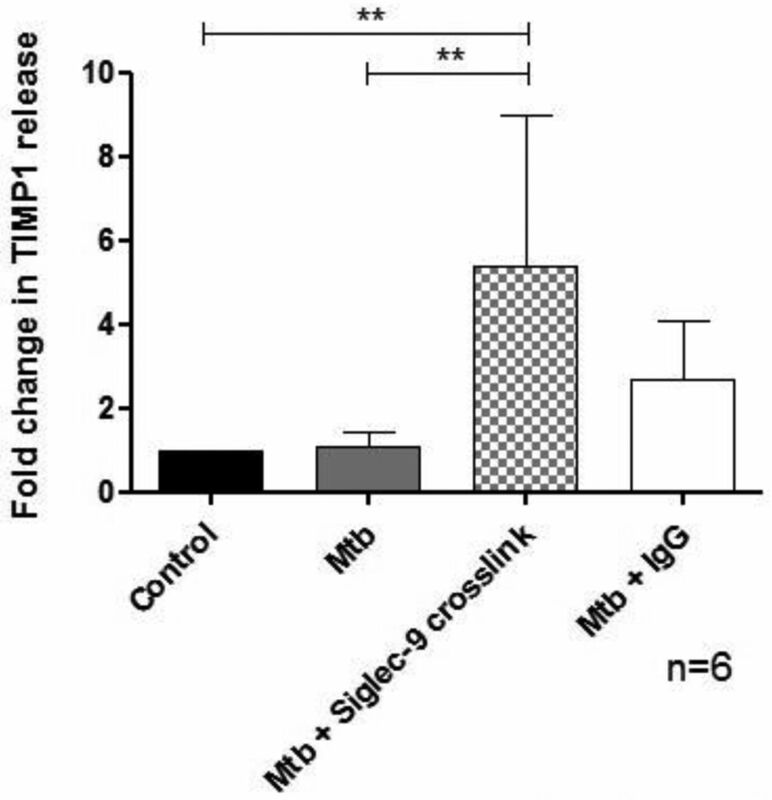 Blocking the functions of Siglec-7 and -9 on both primary monocytes and MDM with neutralising antibodies does not alter the in vitro inflammatory response to Mtb. Antibody crosslinking Siglec-9, but not Siglec-7, on MDMs induces endogenous MMP inhibitor TIMP1 (p = 0.001, see figure 1), lowering the MMP9/TIMP1 ratio which is a predictor of proteolytic damage. Conclusion Crosslinking Siglec-9 on MDMs has potential to reduce their net proteolytic activity in Mtb infection and may reduce harmful tissue damage.